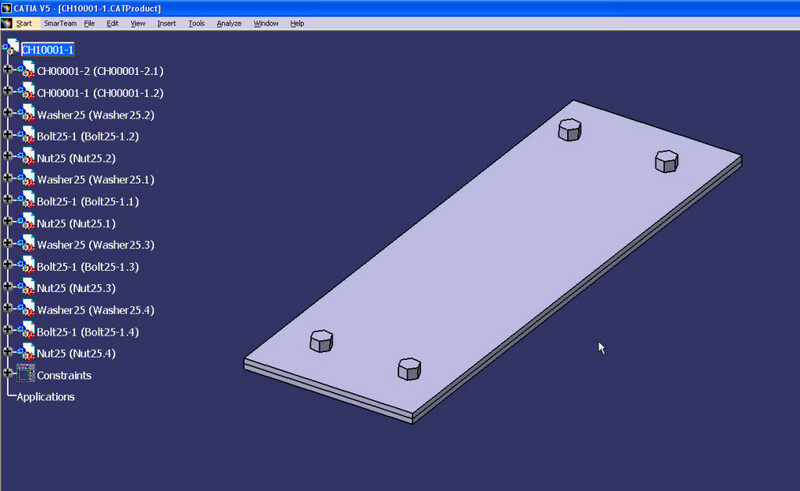 This week we are going to talk about how to create a Bill of Materials in CATIA. We’ll call it BOM for short. First well answer the question what is a Bill of Material? Well my friend this is what wikipedia says “A bill of materials or bill of material (abbreviated “BOM“) describes a product in terms of its assemblies, sub-assemblies, and basic parts. Basically consisting of a list of parts, a BOM is an essential part of the design and manufacture of any product.” But the Question remains… How do we create it from a Product in CATIA? Well first we have to have the Assembly. Open up your CATProduct and make sure that the top most Product is selected. Doing this will open up the Bill Of Material Panel. 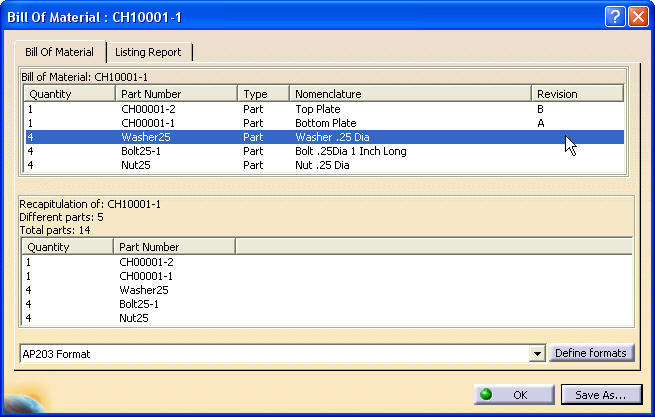 Inside of this panel you will notice that the top part is a detailed list of what parts are in the assembly as well as the type of part/product the nomenclature, part number quantity and revision. This is what we are going for. But lets say we also wanted to see any comments that may be added to the parts. 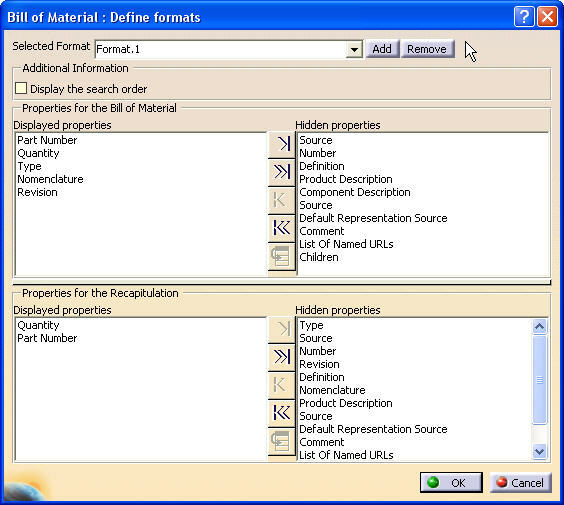 Well then to view those we need to select Define Formats and the window below pop’s up. To add things around you select the column on the right and select the arrow pointing to the right. 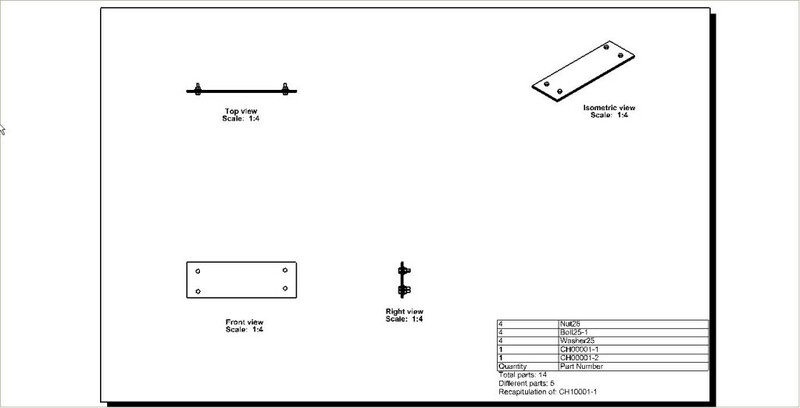 To remove things select it from the column on the left and then select the arrow pointing to the left. To reorder the Displayed Properties you will need to select the Property and then select the bottom Icon. Once you have gotten your Display Properties the way you want them to be you then can save it out a few different ways. You can save it as a Text file, a Excel file or an HTML file. To input the BOM into a CATDrawing all you have to do is select Insert -> Generation -> BIll of Material and then select where you want to place it. Well thanks for reading and have a great week. Till next week.